Haddonfield 2018 Key Voter Dates. OFFICIAL VOTING RESULTS ARE IN! 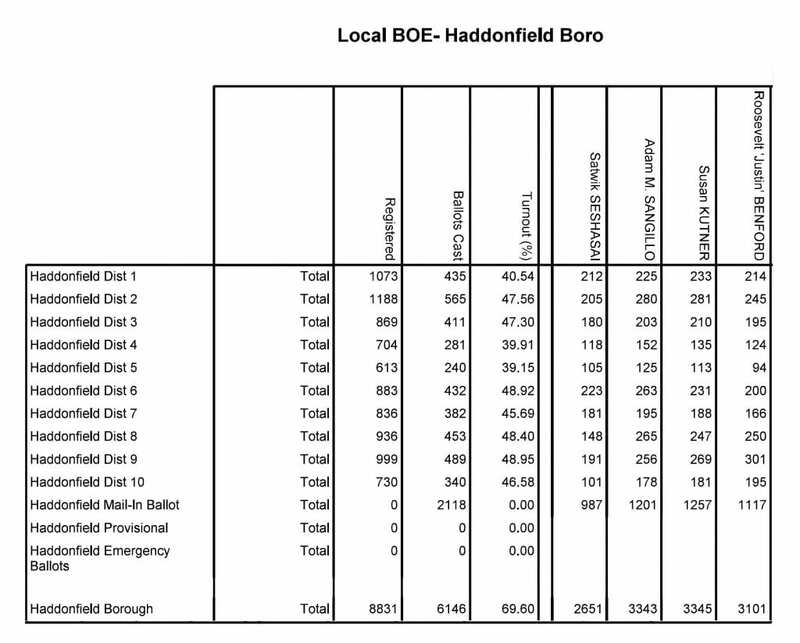 Great job Haddonfield, over 69% of Us Turned Out to Vote! Results below include provisional, mail-in and emergency ballots. The deadline to register to vote in New Jersey is 21 days prior to any upcoming election date. If you’re unsure if you’re registered, or to check if your details are up to date, you can check your voter information on the “See if you’re registered” link under the Register to Vote section. Election Forums and Candidate information. Check back for key dates and additional information as we get closer to elections. 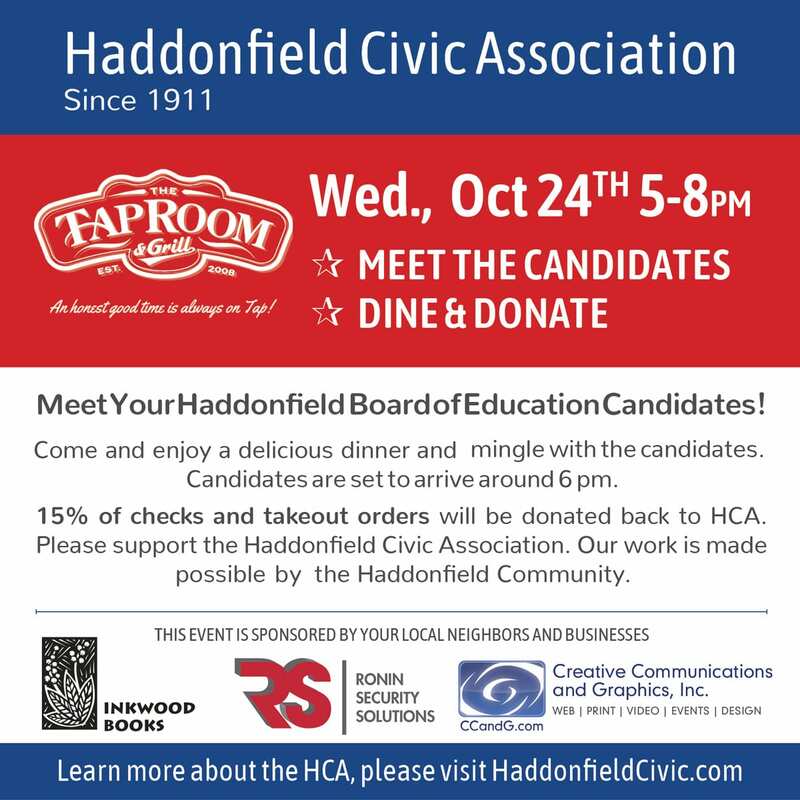 Meet the Board of Education candidates on Wednesday, October 24 at the Taproom & Grill. Come and enjoy a delicious dinner and mingle with the candidates. Candidates are set to arrive around 6 pm. Dine & Donate is from 5pm – 8pm. 15% of checks and takeout orders will be donated back to HCA. The HCA’s work is made possible by the contributions of our Haddonfield community. Please support the HCA. View the “Meet the Candidates” flyer. Take a look at Hadonfield’s sample ballot prior to the election. Voter Registration forms and instructions. Registration forms are also available at Division of Motor Vehicle offices. Find out if you’re registered. Need to Register to vote in NJ? 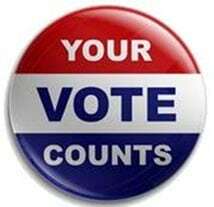 The registration deadline to vote in the next election is 21 days prior to election day. Pursuant to the federal “Help America Vote Act of 2002” (HAVA), if you registered to vote by mail in your county after January 1, 2003, and never voted in a federal election in the county, you were required to provide your county commissioner of registration with identification. Whenever a person delivers a ballot to the county board, that person shall provide proof of the person’s identity in the form of a New Jersey driver’s license, or another form of identification issued or recognized as official by the federal government, the State, or any of its subdivisions, providing the identification carries the full address and signature of the person. The person shall sign a record maintained by the county of all mail-in ballots personally delivered to it. Fill out/Submit to Inkwood Books, The Haddonfield Civic Association will cover postage.